Central american migrants at the Jesús Martínez 'Palillo' stadium located in the east of Mexico City. A woman holds a poster asking: Are you afraid to return to your country? 6 October 2018. Responding to United States President Donald Trump’s proclamation which would deny political asylum to migrants crossing illegally into the country, the UN refugee agency UNHCR, released a statement on Friday saying that the US must abide by international refugee protection accords. The Presidential Proclamation would reportedly ban migrants applying for asylum outside official ports of entry, which will impact migrants attempting to illegally enter the country from the southern border with Mexico, although legal challenges are expected to follow the move. 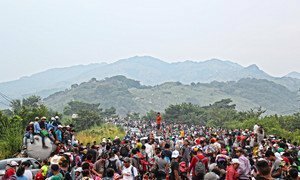 The agency noted that, among the people in Central America and Mexico on the move northward today, many are fleeing life-threatening violence or persecution and are in need of international protection: “UNHCR expects all countries, including the United States, to make sure any person in need of refugee protection and humanitarian assistance is able to receive both promptly and without obstruction, in accordance with the 1967 refugee Protocol to which the United States is a party." The statement points out that it is unrealistic to expect all asylum seekers to present themselves at the border and request protection, because the reality of refugee flight is complex and requires management in a structured way with dignified reception arrangements. Official US southern border ports of entry have had a long-standing lack of sufficient capacity to receive migrants, which is forcing many vulnerable asylum-seekers to turn in desperation to smugglers and cross the border irregularly. Many asylum-seeking families, says UNHCR, who are making this desperate choice, are not trying to evade border authorities. Offering to support the United States, to guarantee that any person fleeing life-threatening violence or persecution is able to reach safe ground and is able to have their claim reviewed, the UNHCR statement concludes with the message that national security and dignified reception of refugees and asylum-seekers are not mutually exclusive, but rather mutually reinforcing. 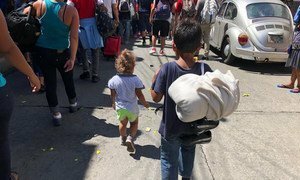 As some 7,000 mostly-Honduran migrants continue their journey northwards toward the United States, governments must prioritize the needs of migrant children when it comes to applying immigration laws and procedures, said the UN Children’s Fund (UNICEF) on Friday.